A large bar takes up one side of the restaurant, but I doubt it gets much use being as Phat Matt’s is only open from 11 am until they run out of meat, which happens nearly every day. The general guideline for closing is 4 pm, but there’s no guarantee the meat will last that long. Sandwiches or meat plates are the offerings. The plates come with two sides. Peach cobbler and pecan pie are usually available for dessert as well as the newest addition: smoked, chocolate-covered, candied bacon. You have no idea how sad I was that they sold out of a special pecan pie made with that bacon! That’s just the meat, and we chose quite well. I appreciate that Phat Matt’s rubs and sauces don’t include salt — frankly, they don’t need it! 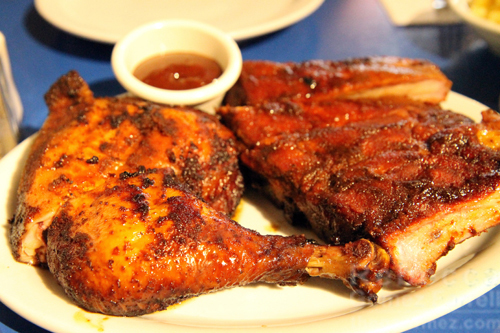 Both the chicken quarter and the Memphis-style pork ribs were impressive. The ribs won out overall for us, as they were very tender and full of flavor — my sister is going to love them. Our extra side of spicy sauce didn’t even get used for the ribs; the slightly spicy, slightly sweet one it came with was delicious enough. I’d say they are taken from the heat just moments after they’ve been cooked long enough to be considered done. For the first time in my life, I watched chicken slide right off the bone as Friend #1 lifted her drumstick up. The meat was almost too tender for me, in that the texture was moister than I like my chicken to be! I don’t think that’d be a problem for most people. 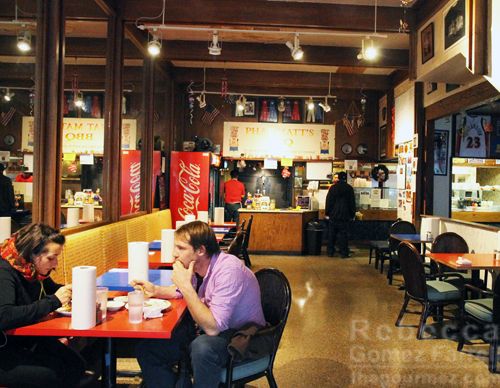 Again, the smoky flavor was great, but chicken can always use an extra kick so that’s when we went for the spicy sauce. 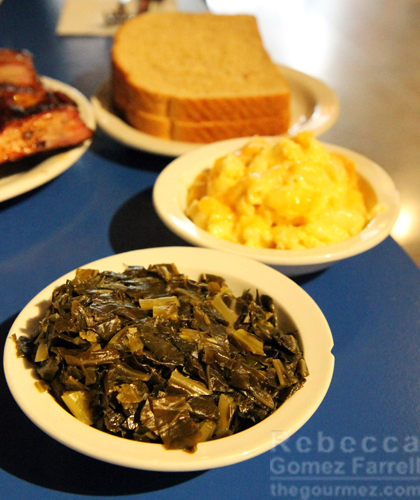 On the sides’ side, we opted for collards and mac and cheese. You can see the bread and butter that comes with each meal in the back of that photo. Plain white sandwich bread accompanying a meat + three is very traditionally Southern, but this foodie sure wishes cornbread was the freebie instead! If you’re in the market for authenticity, however, that’s it. I did a whole series on macaroni and cheese last year, and while I’ve had some great fancy mac and cheese, Phat Matt’s is what I think of when I think of bliss. Sharp cheddar provides excellent tang, and it comes in stringy form on top and saucy form throughout. The noodles, of course, are cooked past al dente as they should be. I will be back, and perhaps sooner than I mean to when I happen to be walking by again and the meat hasn’t sold out. Pulled pork will be my agenda next time…or maybe the hot links? Definitely that pie!